In addition to manufacturing a full line of drums and accessories, Boston's George B. Stone & Son also produced keyboard percussion instruments up until at least the mid 1920s by which time they were also cataloging Deagan instruments as their top of the line offerings. Keyboard percussion instruments built by Stone included xylophones and orchestra bells which were intended for use mainly by theater drummers and gigging musicians who needed their instruments to be compact and portable. 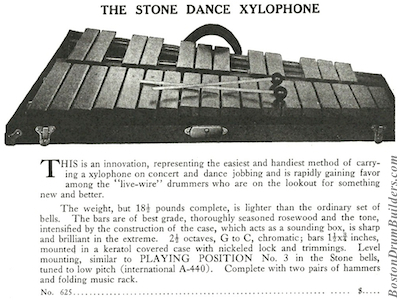 The instrument seen here fits that description well and matches closely with the "Stone Dance Xylophone" as pictured in Catalog I published in 1919. The badge on the case of this instrument dates it no later than 1922. Few other clues as to it's exact date of manufacture can be found. 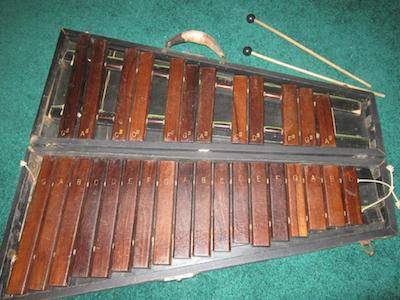 By the mid to late 1920s, xylophones such as this were still available from Stone but were being billed more as entry level instruments rather than viable options for professionals. This was presumably due in large part to the exceptional quality of instruments being turned out by other larger and more capable manufacturers including Leedy of Indianapolis and J. C. Deagan of Chicago. Do you have a mallet instrument by Geo. B. Stone & Son? I want to hear from you! Send Lee a note at lee@vinson.net.